15th July 2016 at 08:03 writing for the TES. Reading and writing are flip sides of the same coin, and neither would exist without the other. Reading paints pictures in the mind: the beautiful alchemy of these little black shapes on a page turning into moving, coloured, vivid images in the dark space of the brain. As a writer puts words down, they have these pictures forming in their head, and they are passing them on to you, to see if you can share the same experience. Words are magic. They are at the heart of all that is significant in our lives and we must love them and be careful with them. As a teacher, I’m using the same process that I do as a writer. I am trying to explain the pictures in my head, so the children say “Yes!” when they’ve just read Seamus Heaney’s poem Digging for the first time, and they understand about that “squat pen”, and how important Heaney’s father was to him. They cross over the “stream-path” with me when we read Charles Causley’s Eden Rock. The children teach me right back: I’d never really understood “The deer are on the bare-blown hill/Like smiles on a nurse” in The Warm and the Cold by Ted Hughes. This year several children offered me explanations, and they were really good explanations, and I felt the light of “Oh yes!” come on in my brain. With fiction, there is a need for me to be quiet and let the words work for themselves. I love the atmosphere in my classroom during the final pages of Patrick Ness’s A Monster Calls. With Shakespeare, everything comes alive. We have to get up and march out iambic pentameter; we have to wade through blood, and not turn back. I am told I make a good Lady Macbeth. My teaching career has been a long journey through many cities and schools, ending up as head of English in an independent school. Much like dropping all those subjects you never loved so well to focus on your A levels, and then finally your degree, I’ve honed it down to the subject I love best. So all day, every day, I teach English literature. Teaching has given me the confidence to know what children love reading in each year group, although a wonderful teacher can bring any text to life. I remember when the literacy strategy came in; Philip Pullman and other authors rose up to say, “Hold on, how are children meant to be creative in a 20-minute chunk?” or whatever it was. “How can they express themselves in exams that are so rigidly searching for A and B, that a massive dose of C is utterly overlooked?” Many of them said they themselves would not pass these exams. This year, there has been a similar outcry over national tests. All of this has a resonance with me: I think, “Yes, I would not write like this; I do not write like this. Why would I expect a child to write like this?” And I love words too much to care about grammatical terms. It’s their effect that concerns me. This year of my teaching career has made me realise that the conditions I need to write in need to be mirrored in my classroom. And that, as scared as I am of people reading my words, the children are too. My words on a page are no more significant than a child’s, and it has cost them just as much. In fact, I am pretty sure their words are more precious. 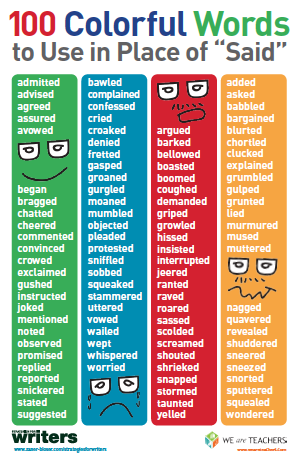 There used to be this poster in classrooms called something like “100 different words for ‘said’”. It implied that the word “said” is boring, when you could write “exclaimed!” or “whimpered” or whatnot. Me, I like “said”, or better still, nothing at all. I love when dialogue flows and I hate when it jars, so I would not teach children any differently. I don’t think you should keep any of the secrets of the magic of language up your sleeve, until, say, these children have become university students. When I learn something that makes my writing better, of course the first people I want to tell are the children I teach. When I see them putting it into practice, it melts my heart. I can only teach them what I love. Language is so personal. Mercifully, they will have plenty of other English teachers, who will love different things, and provide a well-rounded education, and eventually the children will forget about the teacher they had in Year 6 who hated exclamation marks. I let the great writers do my job for me. I love that my children’s writing changes after the poetry of Ted Hughes, that after reading the line “a star falls”, sitting in its own space, their words start dropping and spinning and flying around, and they change again after Lord of the Flies with stark narrative amid gorgeous description. I’ve learned a lot about editing this year, so I’ve been sharing this. Reading the final chapter of Lord of the Flies, my Year 7 class picked up on the repeated use of the word “thicket”. This caused a great deal of mirth, but I realised that, by going through the editing process of my novel, and talking to them about it as I was doing it, I had conferred on them that which I had at the time: a flinching mechanism every time a word was repeated on a page. There were 22 thickets and 13 ululations, and 11 children who were going to edit their writing more carefully. I know that to write I need to sit in a room and not move much for days. That’s just me. I don’t plan because I can’t, I just write a word and another follows. When I get into that lovely state, things start writing themselves. When I get out of it, my mind shuts down on anything creative. In the latter half of the summer term everything at school is so busy, busy: I marked hundreds of test papers, and finished writing hundreds of reports, and completely rewired my sleeping patterns to be up at 4am. When the holidays come round I’m back to being creative: I wake up, or wake myself up, with ideas. So I need to give the children I teach the space to be creative, the right tone in the classroom, and the encouragement to let them share and talk and daydream a bit. They should be writing at home, taking ideas forwards and backwards, noting down thoughts when they come. Writing doesn’t just happen in lesson times: if a child is a writer then it is a constant state. Now we know about readers. Some children just are. Their appetite for books is the same as mine for food at 11am playtime. I’d eat anything then. Any old leftover flapjack in the staffroom. With these children it’s just your job to keep them in books. Keep feeding them. Direct them towards the library. The ones who don’t love reading so much, or perhaps don’t love fiction so much – because, oh, how they fight over the Guinness Book of Records – these are the ones you’ve really got to work to inspire. I find the best way is to read the books, poems and plays with them that I love. It has given me the opportunity to share books with children, and watch their reactions. It has helped me become an author through my knowledge and love of the hundreds of children I have taught and the hundreds of books I have read. It has allowed me to immerse myself in a world full of the best imagination (children’s) and stay surprised and amazed and happy. Those writing assessments I had to get up at 4am to mark? Well, when a child crafts the most perfect sentence or paragraph, you are filled with joy. Writing has also helped me become a better teacher. Which is a flip side that I did not expect. But in a process that has had so many wonderful surprises along the way, becoming a better teacher is a little bit of magic all of its own. Emma Cox is the author of Malkin Moonlight, published this week by Bloomsbury. She is head of English atExeter Cathedral School.